See interview series DVDs at www.mediate.com/Views. Access all Constance Ahrons videos here. Constance Ahrons describes the result of a follow-up study she conducted on adult children from divorced parents. She found that the divorce made the family more complex and restructured, but did not destroy the notion of family for the children. An internationally renowned lecturer, workshop leader, and consultant, Ahrons is considered to be one of the top professionals in the field of divorce. An innovative thinker with over 30 years of experience as an educator, family therapist, and researcher, Ahrons coined the term “binuclear family” and has pioneered the concept of “a good divorce”. As a keynote speaker and lecturer, she is known for her ability to explain complex research concepts and findings in clear, understandable language. One of her trademarks is her use of humor to demonstrate current thinking about societal issues and social change. 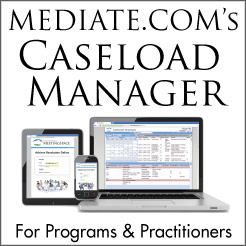 "Mediate.com has been the driving force behind bringing the dispute resolution field online for nearly two decades. It has provided an important public face for our work, and it has done so with integrity and respect for every practitioner, no matter how many cases they've handled."